It’s only a matter of days until they’re all completely naked. No, I’m not promoting a nudist event in Bend. I’m talking about the trees and this wonderful, magical period when they go from leafy green to vibrant bursts of yellow, red, and orange. Visit Bend’s marketing director, Nate Wyeth, snapped this in Drake Park on Tuesday. Want to catch some fall colors before all the trees drop their tops? Here are a few spots worth exploring. This historic park is centered around the sparkling gem of Mirror Pond. It’s on the must-see list for most Bend visitors any time of year, but it’s especially worth a stop in the fall. 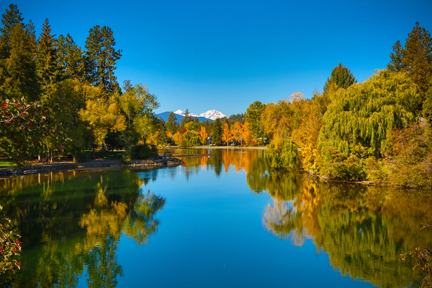 The leafy trees lining the banks of the Deschutes cast their golden reflections on the water, with pockets of vibrant orange and red scattered throughout the 13-acre park. Leaves are beginning to fall now, so this is a good time to go kick through a big pile of them. Wander north toward the Veteran’s MemorialBridge on Newport to do double-duty with a stroll into tiny little Brooks Park tucked on the other side of the bridge. 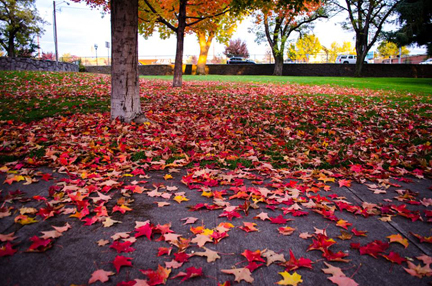 Lovely leaves in Pioneer Park, snapped by Craig Zagurski last Sunday. Just a bit downstream on the Deschutes is DrakePark’s quieter, less flashy cousin. PioneerPark is a meandering, five-acre, riverfront oasis tucked away in the junction of Portland Avenue and Wall Street. It’s been one of my favorite Bend spots since I moved here in 1997, which is probably why it’s on the short list as a site for my upcoming wedding. The park contains a formal rose garden, grassy hills for kids to roll down, and an awesome paved path meandering all the way to the new bridge at the First Street Rapids. You’ll see a nice blend of fall colors in PioneerPark, ranging from striking yellow aspens to leafy red maples. I’m particularly fond of all the picnic areas tucked among the trees, so bring a cozy jacket and a warm lunch to enjoy while you take in the fall colors. Pete Alport snagged this shot of leaves on Mt. Washington last fall. You can travel this stretch of road by car, but wouldn’t you rather enjoy the journey at a leisurely pace without fretting about your fellow motorists backing up behind you? This is a great spot for a bike ride (go here for info on rentals). 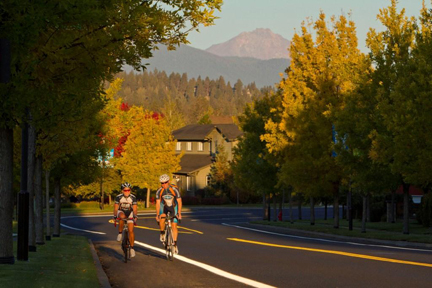 Pedal your way along this pleasant, winding road on Bend’s Westside, taking in endless rows of colorful trees that range from red to yellow to orange to green. At the end of your ride, reward yourself with a stop at Portello Wine Café for something to sip and an order of their delicious bruschetta. Colorado Avenue itself has a lovely sprinkling of colorful trees dotting the roadway and medians, but I’ve found even nicer gems on the side streets just off the main road. Pick one at random and weave your way around narrow neighborhood streets and small riverfront viewpoints. Lots of lovely yellow leaves line Colorado Avenue and its side streets. You’ll spot plenty of splashy oranges and vivid yellows, and it’s a great way to discover quiet pocket parks and lovely little avenues you never knew existed. If aspens are your fall foliage of choice, this is the place to be. They’re practically neon yellow right now, and you’ll see oodles of them scattered around this park abutting 647 acres of old growth forest. This is a great spot for trail running, so if you’re up for some exercise, lace up those running shoes and set out along sparkling Tumalo Creek to enjoy the views. Bend tourists typically only venture into northeast Bend when visiting Pilot Butte or Costco, but there’s a lot more to discover in this quieter, less-showy part of town. Take Greenwood out of Downtown, but hang a left at the light on Eighth Street before you get to Pilot Butte. Stop! That’s what the sign says, right? Enjoy the views of vibrant trees in some of the older northeast Bend subdivisions packed with mature trees. Soak in the views along Eighth as well as the little offshoot streets (an area known as Mid-town), then loop your way through the roundabout at Eighth to head East on Butler Market. Tamarack Park subdivision is on your right, and this ‘80s era neighborhood is chock full of mature trees bursting with vibrant fall hues. Drive slowly to avoid annoying residents, and to give yourself the best possible views of all the lovely, leafy colors. Laurel Pocket Park at 8th & Olney is also quite lovely. To access for parking, take 6th between Olney and Revere, turn east on Penn into the cul-de-sac. A lovely native and drought resistant landscape full of rich colors! This native Texan loves the 4 seasons. Don’t you think the color is especially lovely this fall? Previous article: Five reasons to hit the BendFilm Festival October 10-13!